Discover the pleasure of shaving with Mach 3 Razor Blades. 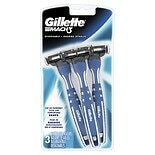 These top-quality blades offer the smooth, close shave that you want while minimizing skin irritation and cuts. Using advanced multi-blade technology and blade cartridge features, this family of Gillette blades turns the process of shaving into an enjoyable daily ritual. 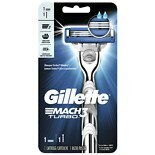 For more than a hundred years, Gillette has advanced the tools of shaving, and at the turn of the 21st century, their Mach 3 shaving system transformed shaving into an entirely new experience. The three coated steel blades of the Mach 3 shaving system are mounted at just the right angle and spaced at the optimum distance from each other to help achieve a closer shave that leaves the skin feeling smooth and clean. Why three blades? In an effect called hysteresis, the first blade holds and extends the hair shaft so that the subsequent two blades can cut the hair further down. With three blades, the surface area of the cartridge presents less pressure per square millimeter against the skin, so there is less irritation. 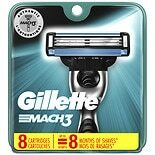 Five structures built into the cartridge, called Comfort Guard Microfins, keep the antifriction blades adjusted to the right angle, so that each stroke of the razor is effortless. Each blade cartridge also features a lubrication strip, which not only spreads a thin film of soothing aloe lotion onto the skin as you shave, but provides an indicator of how effective the blade is. When the strip turns white, that means that it is time to replace the blade cartridge. 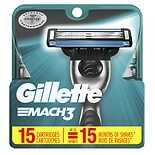 This design is so advanced that these razor blades have been shown to last at least twice as long as previous single-blade disposable razors from Gillette. In the nineteenth century, men shaved with straight razors -- nicknamed "cutthroat razors" for good reason! 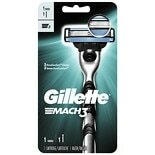 Then, in 1901, a man named King C. Gillette patented the safety razor, offering a breakthrough in the comfort and effectiveness of shaving. 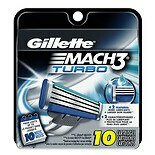 The Gillette line of razors has steadily progressed, with the introduction of Mach 3 Razor Blades in 1998, to break the performance barrier.